A disastrous quarter for Valeant Pharmaceuticals represents a bad sign of things to come for a whole industry. The embattled company again slashed its profit forecast, this time to below the lower end of a previous range. Some problems are specific to Valeant. Intensifying pressure stands to upend business models heavily dependent on raising prices. Simply charging more has worked up and down the pharmaceutical food chain for a decade. While many benefited, drugmakers were the most obvious winners. Biotech firms including Amgen jacked up prices to create much of their earnings growth. Even cheap pill producers took advantage. The Government Accountability Office reported over the summer that about one-fifth of generic drugs had at least one 100 percent price increase over five years. Middlemen have cashed in, too. Wholesalers such as Cardinal Health and AmerisourceBergen could buy drugs ahead of anticipated price increases and thus profit. Pharmacy benefit managers including Express Scripts negotiated discounts on behalf of clients, and kept some of the proceeds for themselves. Insurance companies UnitedHealth and Cigna, among others, raised premiums. Politicians and payers are changing the rules, however. Employers that foot big slugs of insurance-policy costs are demanding bigger discounts. And elected officials, such as presidential candidates Hillary Clinton and Bernie Sanders, have labeled drugmakers greedy. Amgen shares suffered a 10 percent drop after the company said recently that it had little ability to raise prices. Generic drug firms just lost market value on news of an advancing government antitrust probe into price collusion. And wholesaler McKesson’s stock tumbled a fifth because of rivals fighting hard to claim their share of a shrinking pie. Valeant, and similar specialty manufacturers such as Endo International, are particularly vulnerable. They were built on debt-fueled M&A and higher prices. Revenue is now shrinking because of bigger discounts. The $1 billion goodwill writedown Valeant disclosed on Tuesday confirms that assets are worth much less than originally believed. Meanwhile, its $30 billion of borrowed funds looks more daunting with each new threat to expected cash flow. It would be convenient to dismiss Valeant as a single company backed by aggressive, pushy investors laboring under the duress of a buying binge spearheaded by a failed management team. It is that, but also an indicator of so much more. 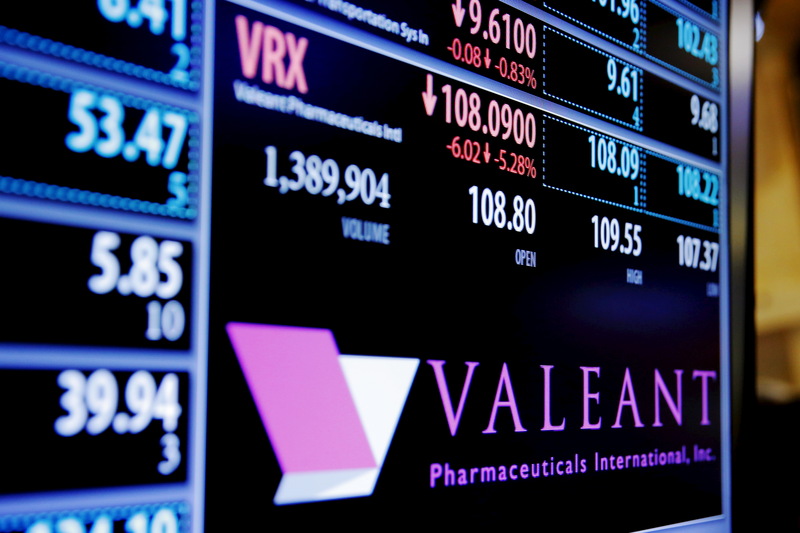 The stock price of Valeant Pharmaceuticals International, Inc. is shown on a screen above the floor of the New York Stock Exchange shortly after the opening bell in New York, December 28, 2015. Valeant Pharmaceuticals on Nov. 8 reported third-quarter earnings that fell short of what analysts had been expecting, and also lowered its forecast for the year. Adjusted earnings are now expected to be between $5.30 and $5.50 a share, compared with the previous outlook of between $6.60 and $7. The company said it lost $1.2 billion, or $3.49 a share, in the quarter ending Sept. 30. Valeant also wrote down $1 billion of goodwill, mostly in relation to the declining value of its Salix division.